Natalie Coulter is the artist and business owner behind Mint & Maple Designs. Mint & Maple offers everything paper: custom wedding invitation designs, hand lettering, greeting cards, stationery and artwork – all designed and hand lettered by Natalie herself. Natalie took that leap of faith in starting her own creative company, and Jesus has blessed that leap of faith immensely. Today, Mint & Maple is a thriving new business, and Natalie gets to wake up each day with another opportunity to do what she loves. You can find Mint & Maple at mintandmapledesigns.com, on Etsy, and on instagram. The best part about Natalie and her dream? We are teaming up for a giveaway of this beautiful print. All you have to do is follow @eringreen and @mintandmaple on instagram, like the picture on both accounts, and tag a friend in each. That’s it! We will announce a winner on Friday! Are you chasing a dream? Do you have a creative business you’d like to showcase? I am all about chasing dreams, and I would love to team up with you. Send me and email and let’s continue the conversation! It’s no secret that I love She Reads Truth. For the past couple weeks, I have been going through the She Reads Truth study of John. Today, I share my thoughts on this wonderful study, AND, give you a discount code for your next She Reads Truth purchase! 1. They are all about getting you to open your Bible. They make it so easy and appealing to wake up and spend 5 minutes reading through scripture and a devo. 3. Their devotionals are available in just about every form you could ask for- in beautifully printed books, online, and even through (my personal favorite) an app. 4. You can go through their studies by yourself, with a group, or, through the online community. 1. First of all, this is my favorite of all of the books they have printed. They feature different artists for each study, and this one is by far my favorite. Anchor and Ink Calligraphy nailed it. The study kit comes with beautifully calligraphed prints and scripture memory cards. 2. Reading a Gospel account brings us back to the focus of everything- Jesus. 1. It’s not an in depth theological study. Each day goes through one chapter, (which is a pretty significant amount of scripture), and the devotional highlights, for the most part, one element of that chapter. If you want to go more in depth, hit up Beth Moore or Tim Keller. 2. Don’t expect to be disappointed. It’s great. From now until midnight Friday, you can enjoy 15% off of your She Reads Truth purchase with the discount code “ERINTAYLORGREEN” Happy shopping! Congratulations to our winners, Emma Stanley and Hannah Diane! Be on the lookout for an email from me on Monday. Thanks so much to everyone who entered! Give Naptime Diaries a visit if you’re still interested in purchasing a devotional- they’re great. Yesterday I talked to you about the incredible difference that waking up early to get into the Word has made for me and my life. Today, as I promised, I’m sharing a few tips that helped me turn mornings into a habit. First and foremost, we have to believe that Jesus can give us rest, even when it means sacrificing an hour of sleep. True rest comes from The Lord. And we must believe that He is bigger and stronger than our lack on inertia in the mornings. 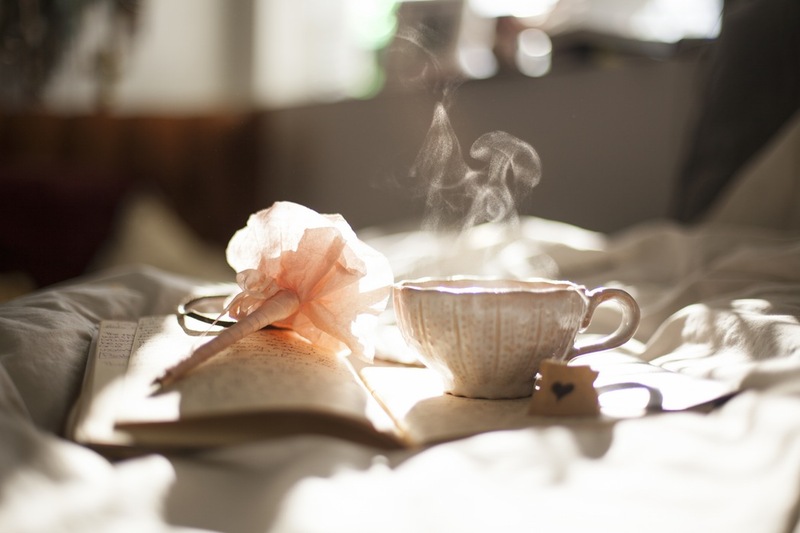 Here are some practical ways to make mornings more beautiful and less painful. Accountability might be the single most important factor (apart from the goodness and faithfulness of Jesus himself) that will make or break setting this habit. Set your alarms together. Wake up together. Don’t have anyone who can physically do it with you? Enroll someone to give you a wake up call every morning. I would have never made it longer than a week without Stephanie those first few months. I used to hate coffee. (I shudder at the thought that I was ever such a person.) But when I came to college, and began running on the wee bitty hours of sleep that I had available to me, and then began waking up even earlier, I started to drink coffee. I weened myself into it, drinking about 30 percent coffee, and 70 percent almond milk, creamer, and sugar. That concoction sounds ridiculous to me now, but playing around with coffee combinations and new creamers made mornings more fun. Try new beans and new coffee roasters and new brewing methods and new creamers- make an adventure out of your morning routine. If reading the Bible in general is a task and a mystery for you, the likelihood of you waking up an hour or two earlier to do so is minimal. So learn how to read your Bible. I love doing Bible studies and devotional books; they help me navigate through the scriptures, and they give me insight from those much wiser than me. You can check out some great studies that I recommend here. One of my first recommendations is She Reads Truth– they provide free devotionals through both books of the Bible and topical studies. New devotionals are available every morning, and you can go through the studies with a beautiful community of women by your side. Find a place where you can be alone with just you and Jesus. In my apartment, that was sitting on the rug in the living room, folded up in front of our coffee table. In my house now, it’s propped up in my bed with a mound of pillows. I’ve done everything I can to make my room the quiet and peaceful escape that I need it to be. My bed is my sanctuary. Soft, white sheets make me feel like I’m sitting in a cloud. Quiet time in a cloud? I’ll take it. Whatever this looks like for you, find out. This is a battle. You’re not going to be thankful for this the first morning your alarm goes off. Maybe not even the fifth, or tenth, or twentieth time your alarm goes off. Give it time. Maybe a full semester. Remember, the goal is to start a habit, and starting a new habit might mean breaking old habits. If you’re used to sleeping and hitting the snooze button as many times as you can, it’s not going to be an easy transition. And, in the end, if after two, three, four months, you’re still hating it, maybe mornings aren’t for you what they are for me. And that’s okay. The theme remains the same- Jesus wants our time and is worth our time. Find a way to get into a rhythm with Him. He’s there every moment of the day, not just before the sun comes up. make sure to tag me in all of your social media posts! I don’t want to miss any of your entries. Rising with the Sun *giveaway! I love early mornings. There is nothing I love more than sitting in my bed with a hot cup of coffee and a great Bible study laid out in front of me. I actually get giddy just thinking about it. It is my favorite part of every day. I love early mornings because it is the one time of day that I feel complete solitude. The sun hasn’t risen, my roommates are asleep, the house is completely silent. It’s my time with Jesus, and there is nothing to interrupt me. No one is going to text me, no one is going to walk into my room, and it’s much too early to think about homework or to-do lists. It’s my time. It’s my time to read and write and pray and be filled with an energy that will carry on for the rest of the day. My mornings are a precious, treasured gift. I hear Jesus speak clearly and lovingly and directly in those wee hours. It’s just me and Him. But it hasn’t always been this way. The thought of early mornings used to make me shudder and cringe, maybe even shed a tear. I love my sleep, and I will sleep forever if the world lets me. So early morning quiet times were not just something that didn’t sound fun or necessary, but to me, they actually sounded impossible/relatively like torture. But as my nighttime schedule amped up with more dinners and friends and meetings and homework, and as I became more and more tired each night, and opened my Bible less and less frequently before going to sleep, I realized that something needed to change. My usual night time quiet times were failing. I was going to need to be a morning person. So my sophomore year of college, my roommate Stephanie and I did something that I have never once regretted. We set out alarms for 6am, and made a pact to wake up together, every morning, to spend time with Jesus. We didn’t do the same study, or talk a whole lot about it, we just committed to holding each other accountable to waking up and opening our Bibles. It wasn’t easy. Honestly, it was really, really hard. Starting that habit did not happen overnight. It was a full four months of struggling with the desire to snooze every morning, and being reminded lovingly by my roommate to get my a** out of bed. Some mornings, it was me reminding Steph to get her a** out of bed. And some mornings, we both caved in and no one reminded us to get our a**es out of bed. It was a daily battle, but a battle that we continued to fight, and eventually, something magical happened. In that semester, everything changed. Christ claimed victory over my battle with the alarm clock, I fell in love with 6am mornings and I fell in love with the Word of God, and my priorities did a 180. I began to love mornings so much, that when my college schedule turned into a student teaching schedule, I voluntarily turned my alarm back yet another hour to make sure I had time with Jesus before heading into a classroom full of 1st graders. I was excited to get out of bed, and I felt a difference in my days. I felt full of life, and energy, and I believed the things that my Creator said about me and spoke to me each morning. Today, two years later, my alarm goes off at 5. And I wake up. Together, Stephanie and I began a habit that will last me the rest of my life. I believe in the power of spending time with a Creator and a Savior who loves us deeply and perfectly and eternally. I believe that fighting to spend time with Him is worth it. Sometimes that means sacrifice and inconvenience. But he blesses our efforts and our obedience and our dedication to Him. And He has IMMENSELY blessed my efforts to spend time with Him. And so I believe in Him, above all, but also, I believe in the sacredness of the mornings. I believe in the power of rising with the sun to start our days with the living and active Word of God. Want to give mornings a shot? Sounds impossible? Tomorrow, I will share a few of the most important steps I took towards making mornings a priority. My hope is that they might turn into a priority for you, too. 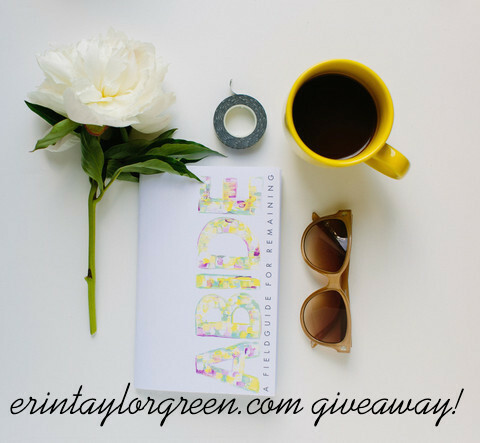 I am thrilled to offer my readers an opportunity to win these great Abide Bible study journals from our friends at NaptimeDiaries! Our hope is that these journals would lead you to spend deep and intentional time with Jesus. There are several ways to enter- just follow the directions on Rafflecopter below. Winners will be announced on Friday! May the odds be ever in your favor.